Keeping your home comfortable. Breathe Easier. When you think about home comfort, chances are you're just thinking about your thermostat or your heating and cooling system. But true home comfort is more than just temperature. True home comfort means maintaining the right amount of temperature, humidity, and clean, fresh air throughout every room in your home. With the new Lifestyle concepts from Airtemp and Honeywell, your home comfort system will be designed to work together to ensure you get the most comfort and efficiency for your money. From air cleaners that filter microscopic particles to humidity control, Airtemp and Honeywell can make your home a better place to breathe. With a wide range of solutions you can now customize your home for year round comfort. 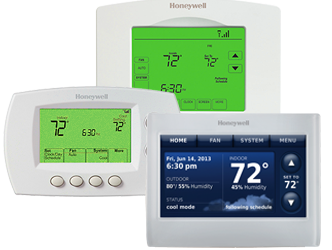 So whether you're looking for cleaner more comfortable air, energy savings, or both, Honeywell and Airtemp can help. Airtemp and Honeywell recognize the desire of homeowners to breathe cleaner air. While portable air cleaners can provide a level of effectiveness to individual rooms, Honeywell whole-house air cleaners are installed on your Airtemp central heating and cooling system. It cleans the air going through your ductwork and pushes clean air out to all rooms in your home. Along with cleaning the air, Honeywell air cleaners can save you money by keeping your heating and cooling equipment clean, improving efficiency and extending service life of your Airtemp system. Airtemp and Honeywell can maximize the comfort offered to homeowners with the choice of a Honeywell whole-house humidifier or dehumidifier. Unlike portable units, a Honeywell whole-house humidifier or dehumidifier installed on your Airtemp system works to automatically maintain proper humidity levels throughout your entire home. And because proper humidity levels provide a more comfortable living environment, you can adjust your Honeywell thermostat for greater energy savings.